Islamic law is absolutely incompatible with true democracy. It is a theocratic system with Allah alone at its head. Allah's law is interpreted by a ruling body of clerics. There is no room for a secular political system in which all people are treated as equals. Quran (45:21) - "What! Do those who seek after evil ways think that We shall hold them equal with those who believe and do righteous deeds,- that equal will be their life and their death? Ill is the judgment that they make." Unbelievers are not equal to Muslims. This is dutifully reflected in Islamic law. Quran (5:44) - "Whosoever does not judge by what Allah has revealed is among the disbelievers." A government run by "true" Muslims is a theocracy. Anything less, including democracy or secularism, is a sign of apostasy. This is why terrorists feel justified in their fight for an Islamic state. Quran (39:9) - "Are those who know equal to those who know not?" Quran (4:141) - "...And never will Allah grant to the unbelievers a way (to triumphs) over the believers." This is at odds with democracy, which allows anyone to serve in a position of power over others regardless of religious belief. Quran (63:8) - "...might (power) belongs to Allah and to His messenger and to the believers;" ie. not to anyone else. Quran (5:49) - "So judge between them by that which Allah hath revealed, and follow not their desires, but beware of them lest they seduce thee from some part of that which Allah hath revealed unto thee" Allah's Quran takes priority over the desires of the people. A democratic nation is by nature one that is not governed by Islamic law, meaning that a Muslim citizen would have divided loyalty. It's clear from this verse which side he must choose. Quran (12:40) - "...Allah hath sent down no authority: the command is for none but Allah..." Sometimes translated as "None have the right to legislate except Allah." Quran (4:59) - "O you who believe! Obey Allah and obey the Messenger and those in authority from among you..."Obedience is strictly limited to a government drawn from believers, not from the broader community. This verse has also been used to justify submission to autocratic rule, however oppressive it may by. As an Arab tradition put is: "tyranny is better than anarchy." Quran (9:3) - "...Allah and his messenger are free from obligation to the unbelievers..." Muhammad used this "revelation" to dissolve a standing treaty and chase non-Muslims from their homes if they wouldn't accept Islam. This practice would be incompatible with democratic rule, in which everyone is considered equal. Sahih Muslim (19:4294) - "When you meet your enemies who are polytheists [Christians...], invite them to three courses of action. If they respond to any one of these, you also accept it and withhold yourself from doing them any harm. Invite them to (accept) Islam; if they respond to you, accept it from them and desist from fighting against them ... If they refuse to accept Islam, demand from them the Jizya. If they agree to pay, accept it from them and hold off your hands. If they refuse to pay the tax, seek Allah's help and fight them" Non-Muslims are intended to be subordinate to Muslims. Sahih Bukhari (89:251) - Allah's Apostle said, "Whoever obeys me, obeys Allah, and whoever disobeys me, disobeys Allah, and whoever obeys the ruler I appoint, obeys me, and whoever disobeys him, disobeys me." The ruler referred to here is the Caliph, who is appointed by Allah, not by popular election. Democratic rule has no legitimacy against the will of the Caliph who, as we see by chain of reference, has the authority of Allah. To quote the renowned Muslim Brotherhood cleric, Sayyid Qutb, "It is Allah and not man who rules. Allah is the source of all authority, including legitimate political authority. Virtue, not freedom, is the highest value. Therefore, Allah's law should govern the society; not man's." This is echoed by two recent fatwas posted on Islam Q&A, both of which state that democracy is "contrary to Islam." Number 07166 says that "Democracy is a man-made system, meaning rule by the people of the people.... [In Islam] rule is for Allah and it is not permissible to give legislative rights to any human being." 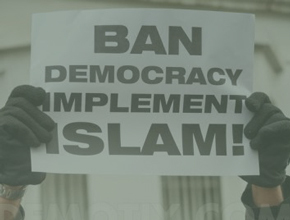 Number 98134 adds that democracy "is at war with Islam and its followers," effectively sanctioning violence for the cause of Sharia. Islamic law is based on the Quran and the Sunnah,which are set and fixed. Laws made by fallible men (particularly non-Muslims) are not necessary; government need only apply Islamic law. Nor should democratic rule take the place of Allah's perfect law, which tells us everything we need to know about daily life (down to which hand a man should "hold it in" while urinating). If Allah is not the authority then anything less is a secular dictatorship, including rule even by a Muslim populace. As an American-Muslim jurist complained in a recent fatwa, "Democracy gives free reign to the authority of the Ummah, and puts no ceiling on it." Also, the law of one person, one vote is essential to democracy but heretical to Islam. According to the Quran, the testimony of a woman is worth only half that of a man, and Jews and Christians are never to have equal standing with Muslims under the law (and certainly never to be in a position of authority over Muslims). Atheists are to be killed outright. Reform-minded Muslims prefer to ignore all of this and instead point to Quran (42:38), which contains the phrase "[Muslims] who (conduct) their affairs by mutual consultation." Also recruited as as evidence that Islam is compatible with democracy is a weaker (non Sahih) hadith in which Muhammad supposedly says, "My community will never agree on an error." On this, is based the much ballyhooed concept of "ijma" or consensus among Muslims for determining matters of Islamic law. But ijma, has always been controversial and rarely practiced within Islam. Some interpret it to mean "consensus of the scholars" - having nothing to do with the opinion of the community at large. Even when its legitimacy is recognized, ijma is accepted only as a secondary (or tertiary) form of authority, behind the fiqh councils. Also, it bears pointing out that ijma and consultation are applicable only within the Muslim community (and probably limited to the "consensus" of males). For example the main Islamic party in Malaysia, often held up as an example of 'moderation', said, in 2018, that, in a well-run government, Muslims make decisions while non-Muslims carry out what has been decided. American scholar Jamal Badawi (who is often billed as a 'moderate') says that it is the duty of Muslims to bring about Islamic rule: "The Quran is full of direct and indirect, implicit and many times explicit indications that show that the establishment of the Islamic order is a requirement on Muslims whenever possible." He also scoffs at secularism: “If a Muslim believes that there is any human being who has the right to make laws other than Allah then obviously this is total divergence from the path of Islam. Or any person who believes that secularism is superior to the law of Allah, he's violating the basic Quranic tenets"
In 2017, the Islamic State published an infographic presenting 10 reasons why democracy and Sharia contradict each other. While most other Islamic scholars may not agree with the tactics of IS, all of the points made seem solid. That same year, the top Muslim religious advisor for the Australian armed forces was revealed to be not only in support of an Islamic extremist group, but an advocate for Shari a law over democracy. Sharia is not the fringe issue that apologists often pretend it to be. Even Linda Sarsour, a Muslim-American personality who is normally savvy, called for "Jihad" and told an audience of co-religionists at an ISNA convention in 2017 that "Our top priority is to protect and defend our community [ie. we Muslims] and not to assimilate or please any other people or authority. Our top priority is to please Allah and only Allah". When the list of 57 OIC member states is compared EIU's Democracy Index, over half (32) are authoritarian regimes, and only six are "flawed democracies." None are full democracies. Muhammad and the caliphs who succeeded him ruled on Allah's authority and did not submit their decisions to the will of the people. Neither is there any tradition of democracy in the 1400 year history of Islam in the Middle East and Persia. If the entire world became Muslim overnight, it is highly doubtful that democracy would last, since it would be applicable only to the most mundane of matters not already decided by Islamic law. See also Can a Muslim be loyal to a non-Muslim government?